Students in Generation Z would rather learn from YouTube videos than from nearly any other form of instruction. 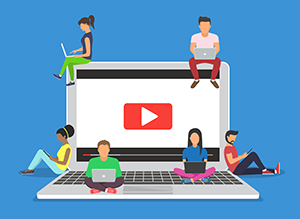 YouTube was designated as the preferred mode of learning by 59 percent of Gen Zers in a survey on the topic, compared to in-person group activities with classmates (mentioned by 57 percent), learning applications or games (47 percent) and printed books (also 47 percent). A majority (55 percent) believe that YouTube has "contributed to their education." In fact, nearly half of survey participants (47 percent) reported spending three or more hours every day on YouTube. The only method of instruction that beat out YouTube? Teachers. Almost four in five Gen Zers (78 percent) reported that their instructors "are very important to learning and development." That's nearly 20 percentage points higher than the YouTube option. While Millennials also value teachers above all else for learning (chosen by 80 percent), that's followed by printed books (60 percent), YouTube (55 percent), group activities (47 percent) and apps or games (41 percent). Yet roughly seven in 10 respondents for both groups said they're more likely to try to figure out problems on their own first (using the internet, textbooks or friends) than to ask a teacher for help. People classified as being part of Generation Z were born between 1996 and 2010. What distinguishes them is that they've been immersed in digital technologies during their entire lives. Millennials, also referred to as "Generation Y" or "Gen Next," were born between 1980 and 1995 and have experienced the transition to digital innovations. This survey, conducted by Pearson and Harris Poll, was based on responses from a nationally representative sample of 2,587 people ages 14 to 40 and chosen based on their ages, education and participation in other research projects. Interestingly, Millennials were more likely to say they prefer to take as many online classes as possible compared to Gen Zers (45 percent vs. 26 percent). And they were more likely to buy into the idea of being able to achieve a rewarding career without college (40 percent) vs. Gen Zers (25 percent). Researchers also found that while Gen Zers were more likely than Millennials to believe that they had more opportunities to succeed than their parents did (56 percent vs. 51 percent), both showed equal amounts of optimism for their futures (57 percent). However, Gen Zers were more driven: Sixty-five percent said that their "life goal" was to "make it to the top of their profession," compared to 43 percent of Millennials who agreed. Gen Zers were also more altruistic: Sixty percent said they wanted to help people less fortunate, compared to 48 percent of Millennials. The Pearson/Harris Poll report is available with registration on the Pearson website.